The long simmering debate over the wisdom of running a large tar sands crude oil pipeline through the headwaters of the Mississippi and prime northern Minnesota wild rice areas is entering a new phase. This week, the Minnesota Department of Commerce released a draft Environmental Impact Statement (EIS) on the project, triggering a 60-day public comment period and more media scrutiny. Minnesota Public Radio ran a piece headlined: New environmental review weighs alternative routes for Enbridge pipeline, City Pages ran: Enbridge pipeline report ignores alternatives (like not building a new one) and the Star Tribune ran: Enbridge pipeline could cause more damage than alternatives, but it’s not largest spill risk. The EIS looks at the proposed expansion of Enbridge Line 3, a 1,000-mile-plus pipeline from Alberta, Canada to Superior, Wisc. Enbridge’s current Line 3 is old and failing. Enbridge wants to abandon that line in the ground and install a new and larger pipeline, including a 337-mile stretch through northern Minnesota. 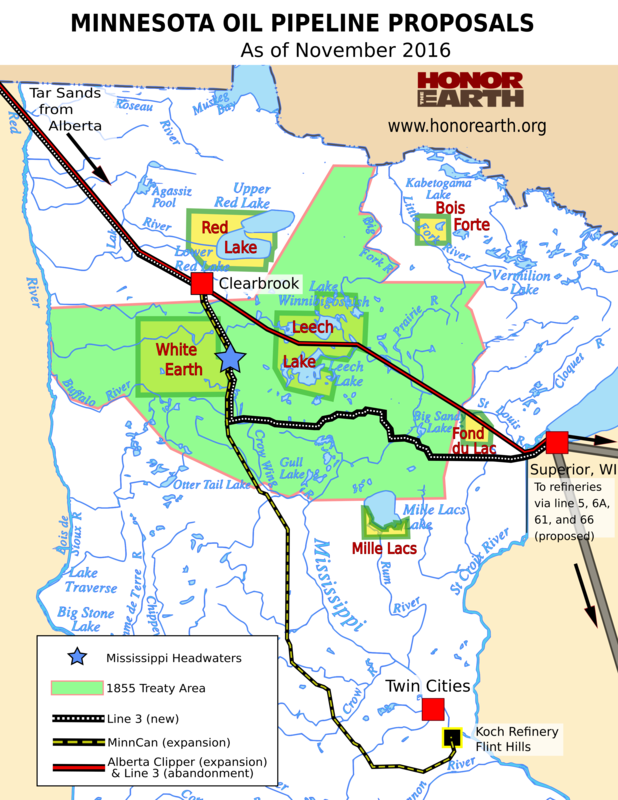 Part of the line would follow a new route that would take it through the Mississippi headwaters region (see Honor the Earth’s map. at right). The Department of Commerce will revise the draft EIS based on public comments and release a final EIS this fall. The news coverage is helpful, but don’t expect any of the journalists read the full draft EIS; it’s 1,894 pages long. (Nighttime EIS reading here.) That’s not a knock on journalists, they have to get out the highlights. But lawyers and volunteers from environmental groups such as Honor the Earth, MN350 and the Sierra Club (a group I volunteer with) are doing a critical review of the draft EIS right now. Watch for their analysis and action opportunities in the coming weeks, and opportunities to attend one or more of the 22 public hearings scheduled across the state. There are at least three arguments that proponents will make for how the Line 3 Expansion Project would benefit Minnesota. Response: First, these are short-term jobs. There are few if any permanent jobs for Minnesota. Second, we have seen the impact of the man camps in North Dakota. These are very hard on communities, particularly Native American communities. (More on this in a later blog.) We would do much better to encourage investments in renewable energy, which could create permanent, good paying jobs in the state. Natalie Cook of the Sierra Club’s North Star Chapter told City Pages that the EIS offered a “false choice” of different pipeline routes, leaving real alternatives behind. Minnesota should be investing in public transit, technologies to improve fuel efficiency, and infrastructure to support electric car ownership, she said. 2. The pipeline would increase the local tax base. Response: True, the question is, is it worth the risk? As the City Pages article notes: “The largest spill in Enbridge’s history occurred in 1991, when Line 3 leaked 40,000 barrels — or 1.7 million gallons — of oil into the Prairie River.” This was also the largest inland oil pipeline spill in U.S. history. This spill would have flowed into the Mississippi River had not occurred in the winter when the river was frozen. 3. Failing to approve the pipeline will increase Minnesota gas prices. The City Pages article quotes Neil Earnest, a Texan chemical engineer who testified for Enbridge before the Public Utilities Commission. H said if there isn’t enough oil to go around, midwest refiners would divert supplies to Chicago to take advantage of higher prices there, thus decreasing Minnesota’s stock. Minnesota prices would increase to balance supply and demand. Response: Few people want to pay more for their gas, but this is a scare tactic. This proposal is not about U.S. Energy Security or Minnesota’s gas demand, but corporate profits. 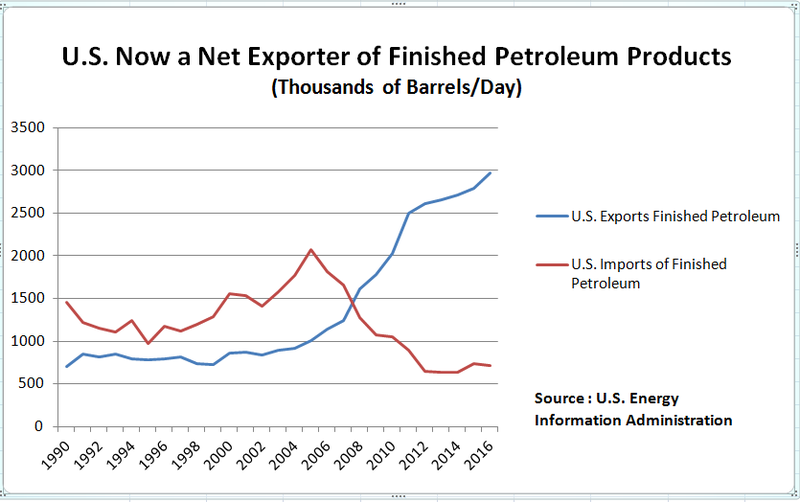 Yes, the U.S. still needs crude oil imports, but we are currently importing more crude than we need. We have become a net exporter of gasoline and other finished petroleum products. Our net exports have been growing, as the chart to the right shows. The overall gasoline and diesel demand in North America and other [developed] countries is expected to decline over the next two to three decades. On the other hand, the global demand for crude oil, especially in emerging economies, is projected to continue to increase ‘for the next 25 years and beyond’, which presents attractive export opportunities, considering Canada’s sizeable oil reserves. The project’s downsides are many. It threatens high-quality wild rice waters as well as tourism and recreation areas. It violates the Treaty of 1855, which gives Anishinaabe people (Ojibwe) the right to hunt, fish and gather wild rice across in areas the pipeline would cross. Enbridge has failed to adequately consult with them. All that, and we don’t need it. More on these issue coming soon.